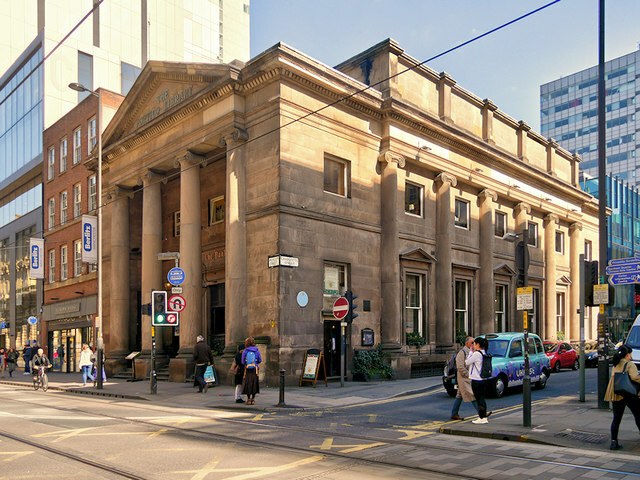 This grand building at the corner of Moseley Street and Charlotte Street was designed by Thomas Harrison for the Portico Library which opened in 1806. It is Harrison's only surviving building and was the first Greek Revival building in the city. When it opened, the library occupied the whole building and entrance was on Mosley Street with four Ionic columns set slightly forward and steps between the columns. Today, the ground floor is tenanted by The Bank, a public house that takes its name from the Bank of Athens that leased the ground floor in 1921. The library now occupies what became the first floor with its entrance on Charlotte Street (SJ8498 : Portico Library Entrance, Charlotte Street). The Portico Library (aka The Portico or Portico Library and Gallery) in Manchester, is an independent subscription library founded in 1806. The library, mainly focused on 19th-century literature, was designed in the Greek Revival style by Thomas Harrison of Chester, architect of Liverpool's Lyceum and built by one of the founders, David Bellhouse. It is recorded in the National Heritage List for England as a Grade II* listed building (Historic England List Entry Number: 1197930 Link ). Although the building was originally built for the library, the ground floor was leased to the Bank of Athens in 1921 and a floor was added to the gallery creating a new first floor and that is where the library now resides. The library's first chairman was John Ferriar. Its first secretary, Peter Mark Roget, began his thesaurus here. Other notable members have included John Dalton, Reverend William Gaskell, Sir Robert Peel and more recently Eric Cantona.